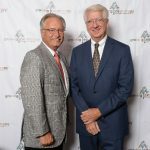 (West Chester, PA – July 19, 2018): The Chester County Community Foundation recently honored Outgoing Board Chair, Robert E. Rigg, CIC, CPCU, CLU, and welcomed Incoming Chair, Anthony Morris, Esq. CEO of Rigg-Darlington Group, Rigg is also an active community volunteer leader, serving on the Boards of Good Works and the Brandywine YMCA. At the Community Foundation, prior to leading the Board, Rigg headed the Investment Committee, served on the Finance Committee, and served on the Strategic Initiatives Task Force. 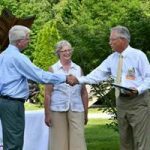 Via the Rigg Family Foundation, Bob and his wife Karen make strategic, generous grants to charities throughout the region. Incoming Chair Anthony Morris Esq. is a partner with Buckley Brion McGuire & Morris LLP. Morris focuses on wills and trusts, estate planning, and business transitions. Morris has served in volunteer leadership positions with the Chester County Bar Association, the Chester County Bar Foundation, and the PA Bar Association’s House of Delegates. At the Community Foundation, Morris served as a Vice Chair and Governance Committee chair, prior to becoming Board Chair. Tony and his wife, Betty, have a legacy fund at the Community Foundation, and they inspire community service in their four sons and four grandchildren. In addition to the changes in Board leadership, the Community Foundation is pleased to announce new Officers, as well as new Board members. Michael A. DeHaven, CPA of Rainer & Co. and Kathy Dean-Bradley, CPA of Belfint Lyons & Shuman will serve as Vice Chairs. Michael R. Horak, CFA will serve as Corporate Secretary/Treasurer. New Board members include Philip C. Wagner, CFA of Bryn Mawr Trust Wealth Management; Donald E. Lynn, Esq. of Larmore Scarlett; James E. McErlane, Esq. of Lamb McErlane; and John F. McKenna, Esq. of MacElree Harvey. The Chester County Community Foundation extends its deepest gratitude and appreciation to Ann Spencer Hutton, William J. Gallagher Esq. of MacElree Harvey, and Stacey Willits McConnell Esq. of Lamb McErlane, who have transitioned off the Board of Directors. 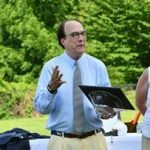 The Chester County Community Foundation has designated L. Peter Temple Esq. of Larmore Scarlett as Director Emeritus in light of his outstanding contributions to the growth and success of the Foundation.